Solidarity, not skepticism: Patrolman Slager's supervisor comforts the killer as the victim's life ebbs away. 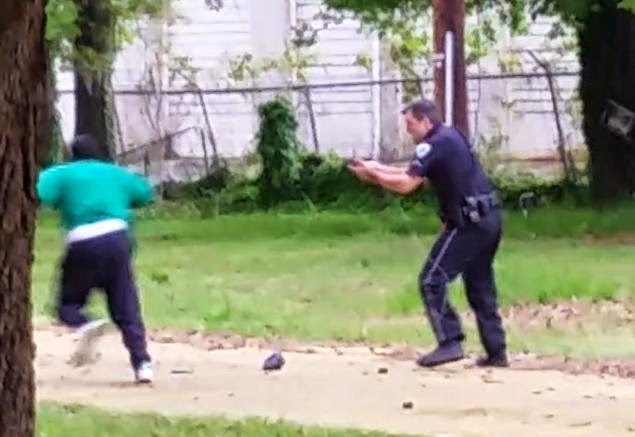 As many have said, were it not for the video, Michael Thomas Slager would have been quickly exonerated – and, most likely, received a commendation – for the killing of Walter Scott. The most remarkable aspect of that video, however, is not the unbearable spectacle of the shooting itself, but rather the composed, almost clinical way that Slager executes the victim, and the ease with which he makes the transition from the killing to the cover-up. Slager’s body language while drawing and firing his gun suggested annoyance, rather than urgency. He never bothered to render aid to Scott, choosing instead to handcuff the dying man – fortifying the pretense that the unarmed man who had fled in terror had been a threat to him. Although Slager had sauntered over to examine and truss his victim, he sprinted – well, waddled vigorously – back to the scene of the previous altercation. He retrieved his Taser and then deposited it next to Scott’s bullet-ridden body. The same result would have been achieved in the murder of Walter Scott were it not for the presence of a young man equipped with a cellphone and armed with exceptional courage and presence of mind. That complication is the only reason why this incident deviated from the long-established script. If not for the video, this shooting -- like all other officer-involved shootings – would never have been investigated as a potential criminal homicide, but rather as an “assault on law enforcement.” From that perspective, Scott was identified as the suspect, and Slager as the victim. The immediate priority for the first “investigator” on the scene was to see to the welfare of the assailant, and to reassure him that he had done the right thing. This explains why the “investigating” officer, rather than confronting the shooter, placed a comforting, collegial hand on his shoulder. The supervisor remained in that posture as Slager recited the first draft of what would have been codified as official “truth” – if Feidin Santana hadn’t happened upon the scene while he was on his way to his job in the productive sector. Chief Driggers (r) with Mayor Summey. His ministry as senior deputy chaplain with the Coastal Crisis Chaplaincy was “to provide pastoral care and counseling for employees and families of first responders” and assisting “the Mobile Crisis Unit and SWAT teams” in various circumstances. The group’s “Chaplaincy Log” is replete with mentions of ministerial visits and counseling sessions with “first responders,” local police, FBI agents, the Coast Guard, and other members of the State’s enforcement caste. There is the occasional mention of a pastoral visit to a “civilian” in need of comfort, but they are very much the exception. The ministry is overwhelmingly devoted to the needs of the State’s emissaries of official violence, rather than addressing the concerns of the public supposedly served by them. Driggers spent 35 years as a police officer – including a SWAT operator -- before becoming a chaplain in 2008. When he left that ministry to become North Charleston Police Chief, his place was filled by Harry Sewell, who had just retired as police chief in Charleston. Franklin has elsewhere declaimed against Islamic law as if he were an expert. The deficiency he displays in expounding Romans 13 should govern assessments of his competence in interpreting scriptures from other religious traditions. While there’s no way to know if Slager – who, like his victim, had served in the Coast Guard -- had been catechized in that view of Romans 13, he clearly acted on the same assumptions regarding authority and the propriety of summary execution as punishment for Mundanes who do not render the required tribute of immediate submission. The same assumptions were evinced by the studied lack of curiosity on the part of Slager’s comrades at the crime scene, and the readiness with which his supervisors retailed the killer’s fiction to the public. This was an oddly appropriate choice of metaphor, given that a blanket is used to cover something up. Feiden Santana – who, unlike Slagle, did legitimately fear for his life – saw the blanket being pulled over the incident and at considerable personal risk made the evidence available to the victim’s family. Once again: This is the only reason why Slager was fired and charged with murder, rather than being exonerated and most likely given a promotion. Michael Slager’s appearance is that of the clean-cut, all-American family man. His professional behavior was that of a privileged sociopath, which is to be expected: Police officers are vocational sociopaths. Law enforcers – as opposed to peace officers, especially private security operatives – have official permission to employ aggressive violence and escalate it to lethal levels if they meet resistance. They are clothed in “qualified immunity” that protects them from accountability and liability for committing acts that would otherwise result in prosecution. As noted above, when they kill someone, police officers are immediately designated the victim, and the decedent is assumed to be the perpetrator. Police “work” acts as a reverse alembic, refining the worst personality elements of those who engage in it. In his 1988 study “Personality Characteristics of Supercops and Habitual Criminals” (Journal of Police Science and Administration, Vol. 16, pp. 163-167), G.C. Reming found that the behavioral characteristics of police officers who “distinguish themselves by their sustained high productivity” – as measured in self-initiated felony arrests – were indistinguishable from those found among habitual criminals. This should surprise nobody: Both of those groups consist of people who consider themselves licensed to use aggressive violence and selectively exempt from the laws governing lesser people. Slager wasn’t a “supercop”; he was a perfectly ordinary patrol officer behaving in accordance with the professional standards of the department that employed him. His was the routine, everyday sociopathy of contemporary law enforcement. The man who recorded this video is a hero. Given the risk now involved with filming such events, let alone releasing them...takes a lot of courage. "The same result would have been achieved in the murder of Walter Scott were it not for the presence of a young man equipped with a cellphone and armed with exceptional courage and presence of mind..."
...who had better go into hiding if he has any sense. Just because Slager has been thrown under the bus by the system, does not mean they will look with fond eyes on the person who forced them to do so. I think this case will be a major turning point, either in the way law enforcement does it's job, or in the way society views law enforcement. Never before have we seen a video that clearly shows what Mr. Grigg has been saying all along. Now that the video is all over MSM, it can't be hidden in a corner anymore. I'm thankful for the courage of one man, Feiden Santana, armed with a cell phone who ded the video. We are becoming more and more aware of the atrocities going on and Will you have cited studies/research that is further confirming a lot of things we are seeing in the police state's we live in. It's a sad state of affairs that in spite of this video and others showing clear evidence of a somethings terribly wrong with our police departments and their brotherhood, & in the administration at large....most will turn their head and ignore, refusing to come to terms what's going to sneak up and bit them very soon in their arse. 1. Just wondering what the pretext for the stop was? What reasonable suspicion did the officer have for seizing the victim? 2. Surprised the video camera operator was not confronted and his video seized as evidence. 3. Presumably we still have to see if a grand jury will be presented enough evidence to indict. If a jury will then see enough evidence to convict. And if a judge is persuaded to punish the murderer with more than a slap---after all the public servant just went through a horrible trauma and just lost his job. Hasn't he been punished enough? And then a union review board gives him his job back with full back pay. Pretty much status quo for most "churches" today, which are far more reverent of Caesar and his legions than they are of the Son of God. 1. It was a traffic stop for a brake light not working. When Slager went back to his car to run Scott's driver's license, Scott ran. The reason he ran was b/c he had warrants for unpaid child support. The whole thing sickens me. 3. SLED has enough evidence to convict and would have w/out the video. However, the video provided not only corroborating evidence that the shooting was while Scott was fleeing (as Slager had said he first fired into Scott's chest but SLED said all bullet wounds were to his back, none to the chest) but also provided evidence of the attempt to cover it up by dropping the taser next to Scott as he was dying. I doubt Slager will get off on this. I wouldn't be surprised if it were a lesser charge he is convicted on but I also wouldn't be surprised if the murder charge is successful, thanks to that video. “A Pennsylvania police officer was charged Tuesday with criminal homicide after investigators concluded she shot an unarmed motorist in the back as he lay face down after a traffic stop over an expired inspection sticker. Authorities accused Hummelstown police Officer Lisa J. Mearkle of shooting 59-year-old David Kassick twice Feb. 2 without legal justification. She was released on $250,000 bail, her lawyer said. He planned a news conference later in the day. He got out and ran before Mearkle incapacitated him with a stun gun, held in her left hand. He was on the ground when she shot him twice in the back with the gun in her right hand, police said. Mearkle, 36, told investigators she fired because he would not show her his hands and she thought he was reaching into his jacket for a gun. The stun gun recorded portions of the encounter, and District Attorney Ed Marsico called it the strongest evidence in the case. He said it appeared Kassick had been trying to remove stun-gun probes from his back. People have always wondered and or questioned if the military would turn its guns on American citizens. Do they need to with the police and military contractors with personal from many different countries? The experiment of a country as a republic called the United States has failed. The question now is, what happens next? God warned the people when they wanted a king. We now have a king the king's name is, government. Where the flock are the charges for the 2nd cop? He did in fact participate in the cover-up of a murder. "Lest we all rush to judgement"
Right, we better not call a "back shooting coward" a "back shooting coward". There was no reason whatsoever for the government employee to shoot the citizen in the back as he ran away, PERIOD. I read that slop, nothing but contortions and hoop jumping in a vain attempt to somehow justify the officer's indefensible shooting. Are you some kind of government worshiping statist?